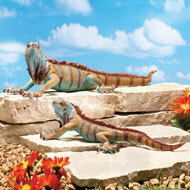 These handpainted iguanas can sit on your patio or hang on a wall to add an authentic Southwest touch in your garden. Choose the small or large iguana or both for a complete set. Each has a hook on the bottom to make hanging easy. Resin. Available in Small (approx.  14"L x 6 3/4"W x 3 1/3"H.) or Large (19 3/4"L x 9"W x 5 1/2"H). 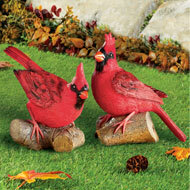 Three colorful songbirds perched atop a branch make this a delightful accent anywhere in your home. 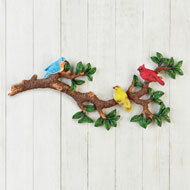 The tree limb has a 3dimensional design with realistic leaves and bark texture, and it features a cardinal, yellow finch and bluebird nestled on top. Hardware on the back makes hanging easy. Resin. 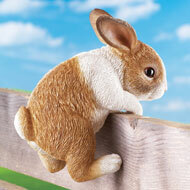 22 1/4"L x 2"W x 8 3/4"H.
This cute bunny can't wait to join the fun on your side of the fence! The realistically handpainted bunny peeks over the top of your fence or railing while his back end hangs from the other side. Fits fences 1 1/2"W. Resin. 5 1/4"L x 5"W x 7 1/4"H.
Whether you live on the beach or just wish you did, this inspirational wall art is a great addition to your décor. 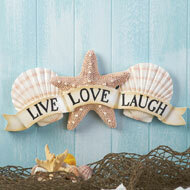 The unique wall art features three sculpted seashells and the words, "Live, Love and Laugh". 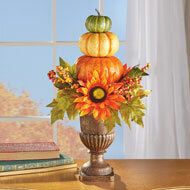 The beautifully sculpted shells have a pearlized finish. Resin. 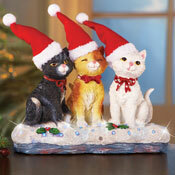 14 1/2"L x 6 1/2"H.
These cute, caroling cats will make a festive and playful addition to your holiday décor. The holly decorated base has colorchanging fiberoptic lights and plays 8 Christmas carols when activated by the motion detector. Requires 3 "AAA" batteries (sold separately). Resin and polyester. 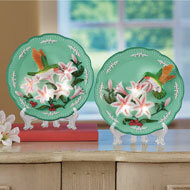 Measures 9 3/4"L x 4 1/2"W x 7 1/2"H.
These beautifully detailed flowers in spring colors will brighten up your décor. 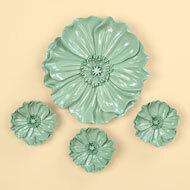 Set includes one large and 3 smaller flowers in your choice of lavender or sage green. Hooks on the back let you arrange them however you please. Resin. Large flower is 10"Dia. x 1"W. Smaller flowers are 4 1/2"Dia. x 1"W. Color available in Sage Green or Lavender. This adorable bunny is carefully handpainted with realistic textures and details. 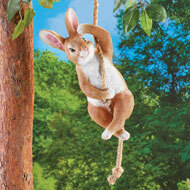 It hangs from a rope that's easy to attach to a tree, or hook anywhere in your yard or garden. Resin. Measures 6 1/2"L x 6 1/2"W x 14"H (31"H with rope). 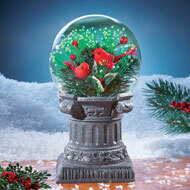 Inside this glass solar ball is a festive display of cardinals, pine branches, holly leaves and multicolor fiberoptic lights. The solarpowered lights automatically shine at night for a delightful display. Includes 1 "AA" rechargeable battery. Glass, plastic and resin. 5 3/4"Dia. x 10 1/4"H.
Flaginspired hearts and a star in the middle are the perfect backdrop for a banner that reads, "Bless Our Home". 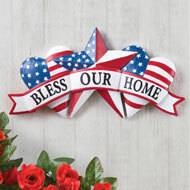 This handpainted patriotic wall art features a 3dimensional design and has hardware on the back to make hanging easy indoors or outside. Resin. 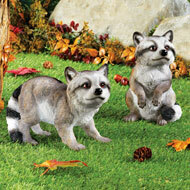 Measures 13 1/4"L x 1 1/4"W x 7"H.
These charming raccoons feature realistic, handpainted details and are perfect anywhere in your yard, garden or on your patio. With intricate textures and plenty of personality, you can choose the sitting raccoon, standing raccoon or both for twice the fun! Resin. Available in Sitting (5"L x 4 3/4"W x 8"H) or Standing (9"L x 4 1/2"W x 6 3/4"H.). 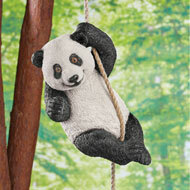 Carefully handpainted with irresistible charm, this detailed panda climbs a rope that's easy to hang from a tree branch or porch eave. 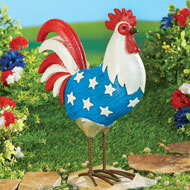 He'll swing gently in the breeze and instantly give your yard a touch of playful charm. Resin. 8"L x 6"W x 13"H with a 3ft. long rope. This friendly fellow waits patiently to greet your visitors and welcome you home. 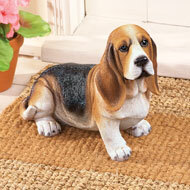 Handpainted with adorable and realistic details, the sweet beagle has plenty of personality and can be used indoors or outside. Resin. 10 3/4"L x 5 1/4"W x 7 3/4"H.
This beautifully sculpted horse will make an impressive addition to your décor. 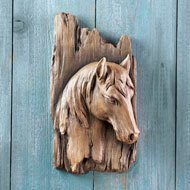 With rustic faux wood styling, the intricately carved horse head features terrific texture and detail. Hook on back makes hanging easy. Resin. 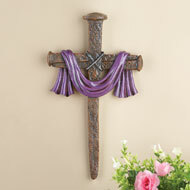 9 3/4"L x 4 3/4"W x 17 3/4"H.
With intricate detailing and a dimensional design, this nail cross features a purple sash, silver rope detailing and intricate textures. A hook on the back makes hanging easy. Handpainted resin. 7 3/4"L x 13 1/2"H.
Perched on a sunny windowsill or in a cozy spot in your garden, this cute kitty finds the perfect spot to relax. Kitty is realistically handpainted with intricate textures and details including a tiny pink nose. Perfect indoors or outside. Resin. Approx. 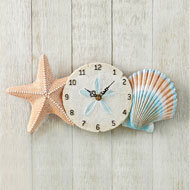 8 1/4"L x 5 1/4"W x 4 1/4"H.
Add a beachy vibe to any room in your home with this handpainted seashell wall clock. The clock face appears atop a sand dollar and a starfish and seashell are displayed on each side. Resin. Req. 1 "AA" battery (sold separately). 14 1/2"L x 7"H.
Attach this delightful sculpture to your downspout to direct water away from your foundation. 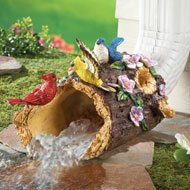 The charming, handpainted downspout looks like a hollow tree stump covered in flowers and colorful birds. Handpainted resin. 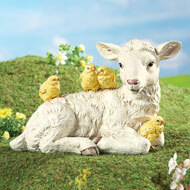 10"L x 6"W x 7"H.
Handpainted with intricate details and textures, this Easter lamb is joined by four sweet chicks. Perfect in your garden, on your porch or in your foyer to welcome guests, this charming lamb is a wonderful addition to your spring décor. Resin. 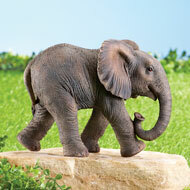 12 1/4"L x 5 1/2"W x 7 3/4"H.
Indoors or outside, this impressive elephant will make a charming addition to your home. 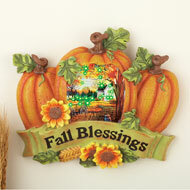 Handpainted with authentic coloring, each features intricate textures and details. Resin. Majestic Elephant is 8"L x 3 1/2"W x 6 1/4"H.
These delightful lifesize dachshunds wait patiently for you to come home. 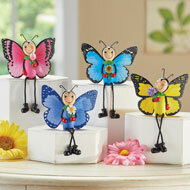 Placed on porch, patio or in the foyer, they're sure to bring a smile to your face every day. 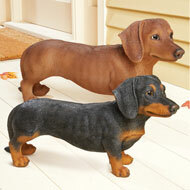 Handpainted with realistic details, choose the brown or black dachshund – or both for a delightful pair. Each features shining eyes and the characteristic long body. Resin. Each approximately 20 3/4"L x 6 1/4"W x 10 1/4"H. Choose Black or Brown. This curious kitty wants to know what's going on in your yard! Handpainted with plenty of realistic details, this cat is available in orange or grey. His adorable face and front paws peek over the fence while his back end hangs on the other side. Fits fences or railings 1 1/2"W. Resin. Each is approx. 5"L x 4 1/2"W x 9"H. Colors available in Orange or Grey. 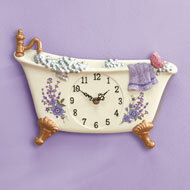 A charming addition to your bathroom, this delightful clock is shaped like an old fashioned clawfoot tub and is accented with beautiful lavender blossoms, butterflies, bubbles and golden accents. Req. 1 "AA" battery (sold separately). Has a hook on back for easy hanging. Resin. 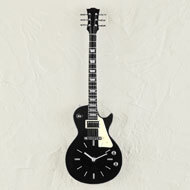 13"L x 2"W x 9"H.
Any music lover in your life will love this unique guitar wall clock. 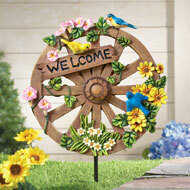 It features a realistic wood design with accurate detailing and a clock face on the body. A hook on the back makes hanging easy. Req. 1 "AA" battery (sold separately). Metal, plastic and resin. 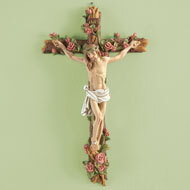 8 1/2"L x 2"W x 21"H.
Exquisitely handpainted, this stunning crucifix features beautiful roses and intricately carved details. It makes a lovely addition anywhere in your home, and a hook on the back makes hanging easy. Resin. 8"L x 2 3/4"W x 13 1/4"H.
A charming addition to your outdoor décor, these handpainted animals have realistic textures and delightful details. At night, solarpowered light automatically shines through cutouts on the body. Each includes 1 "AA" rechargeable battery. Sold individually. Resin. Available in Squirrel (Approx. 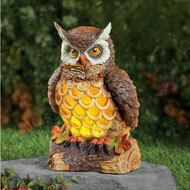 7"L x 5 1/2"W x 8"H) orOwl (Approx. 5"L x 5 1/2"W x 8 1/4"H).